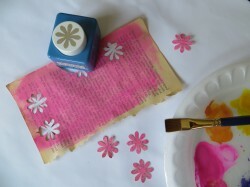 Flower art using old book pages can be a fun addition to your art journal pages or wall art. It can also be used to make cute cards or gift tags. I love the texture old book pages can add to watercolor or other mixed media creations. To create this flower art you will need watercolor paper, watercolors, acrylic paint, old book pages, flower punch, glue or Mod Podge, brushes, round bristle brush for splatters,masking tape, paper towel. Paint several old book pages in different flower colors. Use acrylic paint that has enough water in it to make it transparent. You want to see the book print through the paint . When the paint is dry punch out several flowers. You could also turn the painted page over and draw flowers on the back and cut them out. Cut your watercolor paper a little bigger than the size you want and mask the around the finished size. 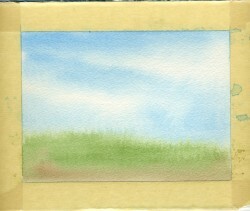 Do a watercolor wash for the sky and background. A video showing how I splatter paint is here. Splatter a few different colors of green paint on the watercolor background. Splatter some flower colors until it looks like a field of wildflowers. 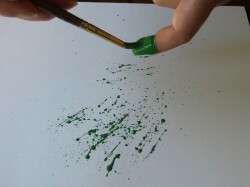 (More instructions and ideas about how to splatter paint here.) After the splatter paint is dry glue or Mod Podge the flowers on splatters that look like stems. 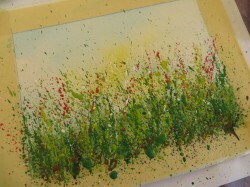 Add a few leaves and more small flowers using acrylic paint and a small brush. This journal page uses old books pages cut in strips to create a nest for a bird. 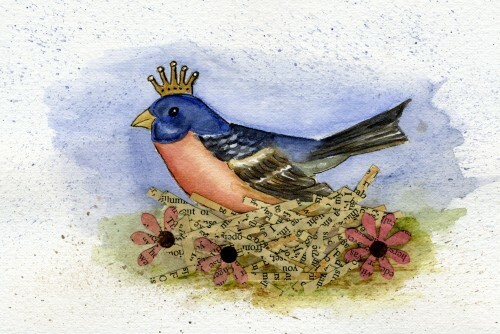 I did the bird and background first in watercolor then added strips cut from old book pages to make the nest. I think it looks best to cut the pages diagonally in strips for the nest. The flowers were punched from pages painted with a watercolor wash to give them color. I used a glue stick then Mod Podge to secure the paper nest. If you don’t want to do the bird in watercolor find a copyright free image of a bird and use it instead. Change the look by adding hearts instead of flowers. Old book pages make a nice border for this art journal page. I also used used acrylic paint, clip art collage, doodling and text cut from a newspaper. 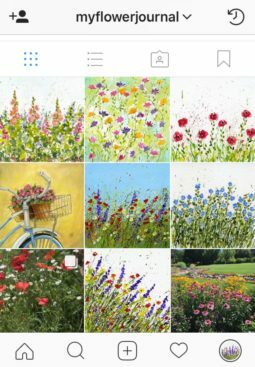 Follow me on Instagram for more flower art ideas. What a fun idea! =) Thanks for linking up at this week’s Pinterest Power Party! Hope you have a great evening! Lovely idea, but the result is super beautiful!! The creativity behind combining the pages, paint and personal touches is so beautiful. I especially love the nest with the old book pages. 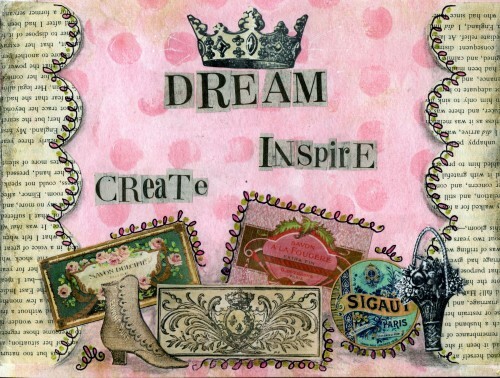 :-) Thanks for sharing at the Inspiration Gallery! Lovely creative pieces, thanks for sharing! Tammie, your “garden” painting is just fantastic. Beautiful colors. Fun little tutorial you offer us here! And such lovely art comes from it too! HPPF! Gorgeous painting and thanks for sharing the process…looks like so much fun! I love your use of the old book pages. My favorite is the bird nest, fantastic! So beautiful! Love that bird nest. Very nice! I love text in collage, what a great idea! What a fun and cheerful idea! It makes me smile. Hello! I’m visiting from the Pinterest party. Thank you so much for the directions on how to make these. I think they are just beautiful and so creative! I’m pinning this, for sure!!! So gorgeous! Love your tutorial and can’t wait to snoop around your blog! I love all of this – I am always gluing old book pages and magazine pages onto everything. I’m going to have to try the flower garden. It would make a great Christmas gift for a friend. Love the bird in the paper nest – so happy I stopped by! Truly lovely. And I think even I could handle the beautiful book page flowers! Thanks for sharing at Inspire Us Thursday at Organized 31. This is such a cute idea-a must try! 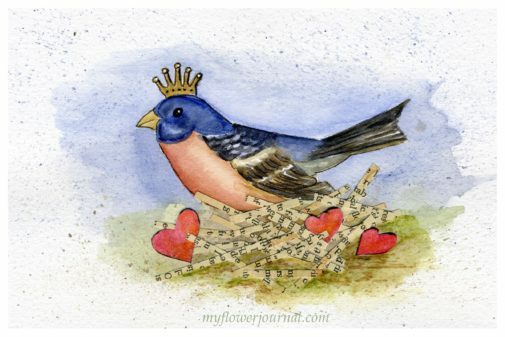 oh Tammy, I love these, that little birdie and nest is just precious!! Oh, my goodness! This is gorgeous! 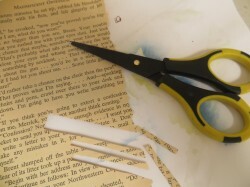 I love using book pages in crafting. Thanks so much for the awesome tutorial. I’d be honored if you linked this up to our All Things Thursday Blog Hop that goes live at 8pm Central tonight. Hope to see you there! How cute and creative! Found you through Creative Every Day. Thanks so much for linking this up to All Things Thursday Blog Hop last week. I am featuring your beautiful artwork tomorrow as one of my picks from last week’s party. Come by and pick up your featured button. Hope you’ll party with us again tomorrow night! Congratulations! This post is featured over at Diana Rambles today and has been pinned in the Featured at Diana Rambles board at Pinterest, Tweeted, and Recommended on G+. Please grab a featured button off my sidebar or via the link under the features. Thanks for sharing this awesome idea! really nice project! i love the way you create the flowers!! I think the main secret to long splatters is having enough paint on your brush. It takes some practice and experimenting to find the right brush and the right amount of paint. I use acrylic craft paint right out of the bottle. It seems to be a good consistency. When you rinse your brush wipe it with paper towel so it doesn’t water the paint down. I use a number 8 round brush. The brand is Masters Touch. I think it is from Hobby Lobby. The bristles are a medium stiffness. Hope that helps. Its kind of a trial and error process, but so much fun once you find the right brush and amount of paint and get your technique down. Great way to upcycle old books. I found many inspiring projects in the Book of Books by Altered Upcycling http://www.amazon.com/Book-Books-Projects-beautiful-ornaments-ebook/dp/B00MGJADUK/ref=sr_1_5?ie=UTF8&qid=1407385936&sr=8-5&keywords=mahe+zehra. They also have a website where you can sign up for free stuff.